The tube's internal electrode system is assembled in a clean-room environment. The components are made from pure materials and manufactured with high precision (+/- 0,02 mm). 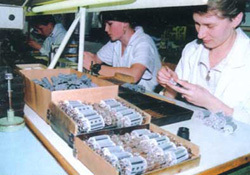 Before assembly all parts are cleaned in an ultrasonic bath and de-gassed in a reducing atmosphere. The control grid is gold plated, the screen grid is plated with copper and graphite. Specially designed fixtures are used during assembly to prevent electrode deformation. 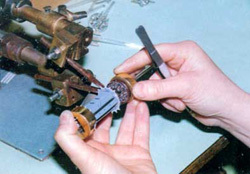 Spot welding is used to electrically connect the internal subassembly to the contacts of the tube base. A complete mechanical and electrical inspection is performed on every system. The tube's internal systems are thoroughly cleaned again and inserted into a clean glass envelope. The envelope is then hermetically sealed to the base. The seal between the envelope and the base is thermally stress relieved (tempered). 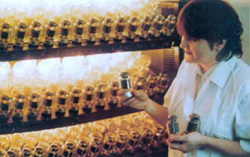 Assembled tubes are evacuated on an automated pumping machine with mechanical and diffusion pumps. During this process, the cathode is electrically heated and its emission substance is activated. All internal parts are heated by high frequency coils, the getter rings are ignited absorbing the residual gas inside the tube. The final vacuum reaches 10-6 Torr - the level required for proper tube operation. The evacuated tubes are equipped with bases. 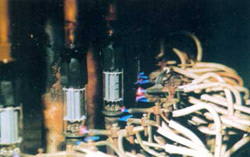 The cathodes are activated and the electrode's potentials stabilized in a special burn-in unit. 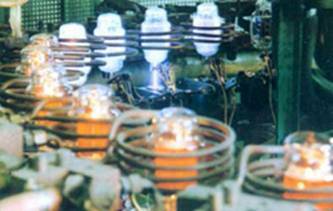 Here, the tubes are exposed to electrical conditions reaching up to 300% of the nominal operating levels. Every tube is electrically tested for parameters such as isolation characteristics, the electrode's current levels covering the entire operating curve, the condition of vacuum, cathode emission capability, filament voltage and current levels. 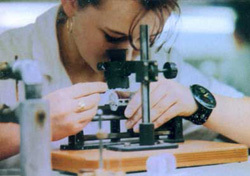 A micro phonic test is performed on every tube. All tubes are then further burned-in for a period of 24 hours at the nominal specified operating voltage and current levels. 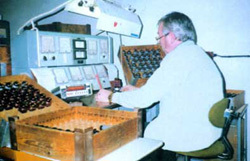 Every month, a random sample is taken from the production to perform a life test of 5000 hours at nominal operating conditions or 1000 hours at maximum specified levels.